Do you love the wood stain look, but don't like the time it takes, the mess it makes and stinky smell of using stain? 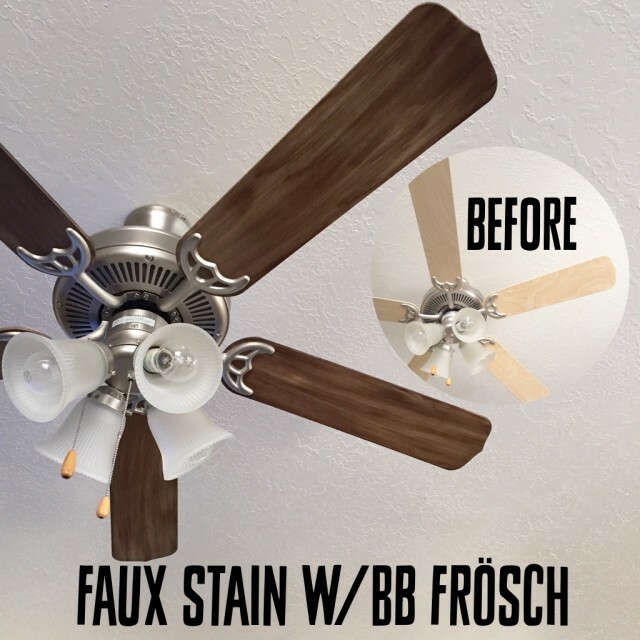 Then you need to try the technique called "faux stain" using BB Frösch! It's fast, easy, affordable and so much less messy! BB Frösch Premium Finishing Wax dries quickly and cures within minutes. The slight odor of the wax is the solvent that enables the wax to dry and cure quickly. The solvent evaporates quickly, instead of remaining on your finished piece for weeks as with other finishing waxes. Make sure your piece is dry and free of any dust. Using a wooden applicator, spread a thin layer of wax on the end of your wax brush. Apply wax in broad even strokes covering no more than one square foot area at a time. With a lint-free wax cloth, remove any excess wax. If excess wax is difficult to “move” or appears “pilly,” the wax has either begun to dry, or you have used more wax than is necessary. No worries! Simply remove excess wax until wax cloth glides easily over surface, and use less wax next time. 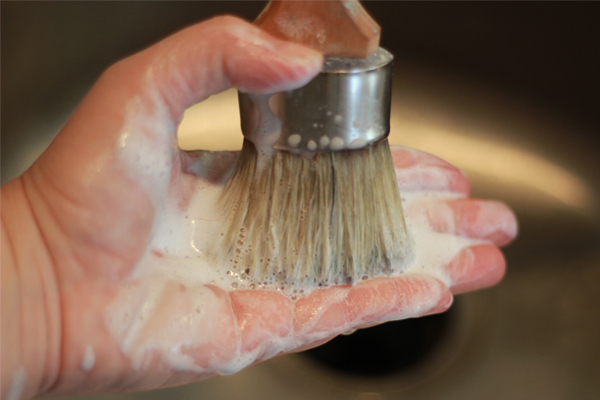 If “dust” appears when you wax, your brush has accumulated excess wax. Once excess wax has been removed and wax has dried (at least 15 minutes) buff to desired sheen using lint-free wax cloth. BB Frösch Dark Premium Finishing Wax can be used to tone, age, and add depth and dimension. Apply dark wax in small areas (no more than 1 square foot areas at a time) in broad, even strokes WITH THE GRAIN. Before wax has dried, remove excess wax with a lint-free waxing cloth. We recommend clear waxing FIRST, before applying dark wax. Any areas of dark wax that are too dark can be modified, or “erased,” by using a cloth dipped in clear wax. Kristin Smith (aka The Shabby Bride), the one who brought us this wonderful product, has shared a fabulous tutorial by n how to wet distress (yes, you can distress with a wet rag instead of sand paper). Please head on over to her guest post on allthingsthrifty.com. Mixing BB Frösch Chalk Paint Powder from BB Frösch on Vimeo. For a WONDERFUL in-depth tutorial, go here to Whipperberry. In a seperate container (plastic jar, mason jar, Cool Whip container…) mix 2 tablespoons* BB Frösch Chalk Paint Powder with 1 tablespoon water until a consistency similar to donut glaze is achieved. A small wisk or spoon works great. If the mixture is too pasty, you went a little heavy on the chalk paint powder, but don't worry! Just add a few drops of water. Pour 8 oz. (1 C)** FLAT FINISH paint into container and stir until chalk paint powder mixture is fully incorporated. *HOW MUCH IS A TABLESPOON? Since chalk paint powder is so fine, it is easy to pack more into a tablespoon than you need. Slightly heaping orgently packed (about 1.1 oz.) is plenty. The more chalk paint powder that is used, the thicker the chalk paint/water mixture will be, and the more your paint will thicken over time, but that's okay! Simply add water if mixed paint becomes too thick. 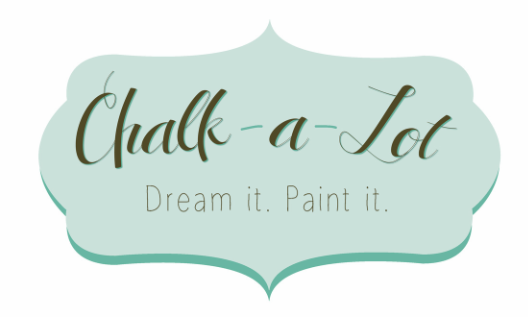 Although mixed chalk paint stores indefinitely, why mix up more than you need? Still want to mix more? 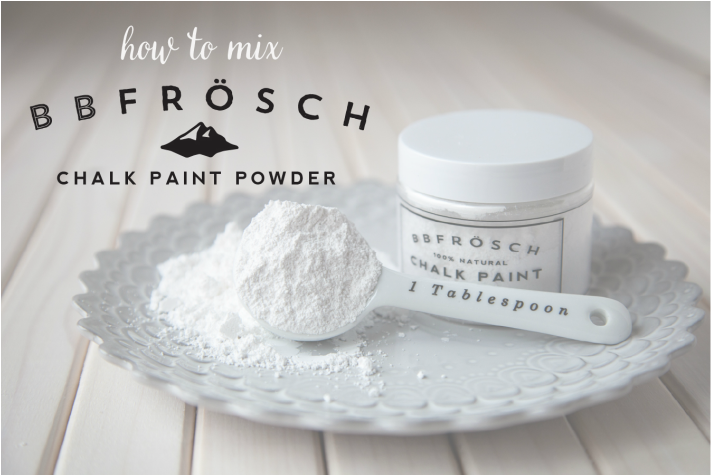 In a seperate quart-sized (or bigger) container, mix the contents of 1 jar BB Frösch Chalk Paint Powder with 4 to 5 tablespoons water until a thick but creamy consistency is achieved. Too pasty? Add water! 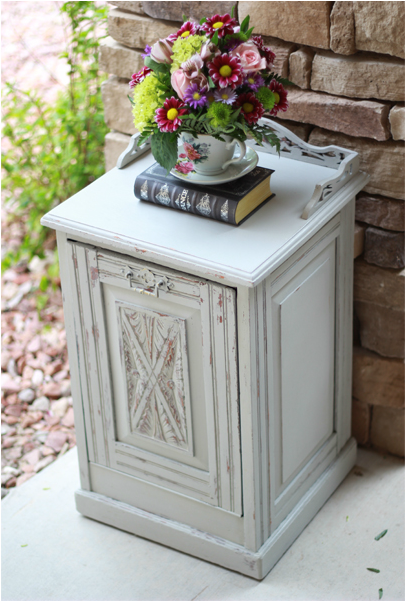 Add FLAT FINISH paint and stir until chalk paint powder mixture is fully incorporated. Store any unused paint in an airtight container. BB Frösch brushes are wonderful chissle-tipped natural brushes, and if you take care of them, they will last FOREVER! Since these brushes are an investment, you need to know some simple brush care basics. Go on over HERE to learn about this on All Things Thrifty for a guest post from the BB Frösch owner, Kristin.